The CRTC yesterday rejected the Bell-led initiative to block piracy websites. FairPlay Canada as it was known, with its coalition of media companies including Bell Media, Rogers Media, CBC and more, had their application denied by the CRTC over jurisdiction grounds under the Telecommunications Act. According to the CRTC, numerous opposition groups filed interventions to fight this website blocking plan, which critics said went against net neutrality rules. Today, non-profit Internet advocacy group, OpenMedia, has detailed how “we defeated Bell”, in an email to its supporters, regarding their DontCensor.ca campaign. 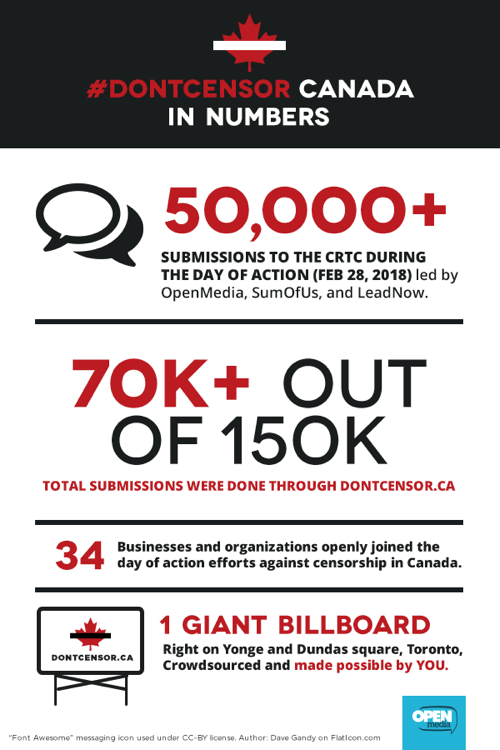 OpenMedia says of the total 150,000 submissions received by the CRTC, over 70,000 of them—or about 47%—were done through the DontCensor.ca website, which made it easy for Canadians to file an intervention. OpenMedia says they were also able to put up a giant billboard on Yonge and Dundas Square in downtown Toronto, led by crowdsourced funding from its supporters. Canadians can now file a response to be submitted to the Parliamentary Standing Committee on Industry, Science and Technology (INDU), as part of its public consultation regarding the review of the Copyright Act which is up for review. You can click here to fill out an easy form made by OpenMedia to share your views with the Federal government. 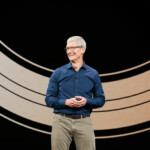 Don’t want an ‘iPod tax’ on your smartphone? Let the government know about it.